Meet Colombo’s newest culinary darling. Making his way through the markets of Colombo and into the hearts of its office crowds with the single-minded determination of a heat seeking missile, Alphonso is the life and soul of Currymuch on Braybrooke Street, Colombo 07.�Within two weeks Currymuch itself has become a favourite amongst the office crowds in Colombo. To get to Currymuch, one would need to walk towards the end of Braybrooke Street-the bright Currymuch sign will greet you just after the Muttiah Road junction to your right. The shop itself is very small-it’s only serves takeaway for the moment, so there’s not much in the way of seats. Actually, there are no seats at all, so don’t bring hordes of friends expecting a dine-in experience. The basic premise of Currymuch is very simple. Serve up a good ‘buth’ packet for a reasonable value. For Rs.200 a pack of rice with two curries, one sambol of some sort and an absolutely delicious portion of boneless chicken, fish or a veggie dish (for the vegetarians) is on offer every afternoon from noon to 2.30 p.m. Currymuch also serves a delicious array of Sri Lankan breakfast ‘isspecials’, including Pol Sambol and Omelette in Roast Paan, a Seeni Sambol bun, compact packs of Kiribath and Lunumiris and a couple of chicken ham and veggie baguettes. A couple of desserts for the famous Sri Lankan sweet tooth are also on offer-the Pineapple Fluff and Peanut Jaggery Mould, at just Rs100. For customers who hail from the corporate offices in the area, the mere relief of a spotlessly clean lunch joint is tremendous. Stefan, who runs the Design Caf� a few metres up from Currymuch was faced with the tricky predicament of finding a good rice packet every day. When his favourite lunch joint closed down, he says he ‘had no choice’ but to open a lunch spot! 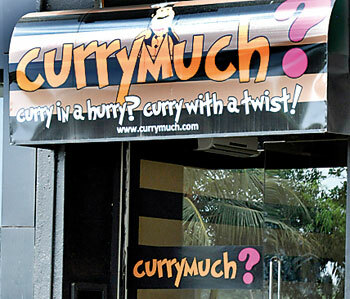 Currymuch was launched recently to great acclaim. The owners are adamant on using 100% Sri Lankan produce for their delicious offerings and all food items are prepared in a sterilized and spotlessly clean kitchen at the premises itself. Alphonso, the vibrant face of Currymuch, is very much part of the appeal. His daily posts on Currymuch’s Facebook page recounting life, love and food from ‘back home in Portugal’ are an integral part of the service provided. Alphonso begins the day by updating the Facebook page on the day’s offerings, so make sure you keep an eye on the Currymuch page for regular updates. While Currymuch remains a takeaway joint for the work weary office crowds; Stefan, Alphonso and the Currymuch team will expand operations-hopefully not just across Colombo. In the meantime drop into the shop on a weekday afternoon if you’re craving for something uniquely Sri Lankan and mercifully hygienic (at a price that’s healthy for your heart!). Currymuch is located at No. 57/2 on Braybrooke Street. Breakfast hours are from 8.30am-10am while lunch is from noon to 2.30pm (don’t bother coming in super early for lunch as it is served strictly after noon!). Currymuch is only open on weekdays for the moment. Would you wear these jeans?